In the nearly three years that George & Sons has been open, the Esterling family has proven that they can deliver the goods. The unassuming seafood eatery is a Hockessin hotspot. At first, it was all about the oysters. Happy to find somewhere other than Harry’s Seafood Grill to satisfy her craving for raw oysters on the half shell, Marcia Stephenson and her husband headed to George & Sons in Hockessin, which opened an oyster bar in 2015. She and her husband now go to George & Sons about twice a month, but now their eyes wander to the entrée section of the menu. “We ‘graduated’ from the oyster bar to sit at the tables,” she said. The first time her husband tired the colossal crab cake – a mound of snowy white meat – he was hooked. Given that George & Sons started life as a seafood market, it’s not surprising that the quality of the ingredients is rave-worthy. But using what’s in the case to create a memorable meal is no small feat, as any restaurateur will tell you. In the nearly three years that George & Sons has been open, the Esterling family has proven that they can deliver the goods. The unassuming seafood eatery is a Hockessin hotspot. Esterling decided to put his experience to entrepreneurial use with the opening of Fresh Catch, which had three successive locations. 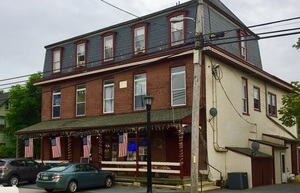 As the business expanded, he moved, and by 1999, he was selling to Greenville-area patrons in a Lancaster Avenue location near Wawaset Park and Westover Hills. Fresh Catch’s most recent location was in the Wilmington Riverfront Market, where he soon realized that customers wanted prepared meals, such as fried fish sandwiches, instead of a piece of ruby tuna to cook at home. Unwilling to compromise on his vision, George III closed and went back to working in wholesale and retail for other operators. Bitten by the self-employment bug, he decided to open George & Sons in 2009. This time, he picked a site on Old Lancaster Pike in Hockessin, near the family’s home in Mendenhall Village. The business moved to its current location, a landmark red brick building, in December 2014. Meanwhile, George IV and younger brother Tyler grew up in the business. On weekends, they often accompanied their father to the Philadelphia seafood market to buy product. When college was not a good fit for George IV, he helped his father open the new business. Tyler was still in high school, so he worked on weekends and holidays. The younger Esterlings came up with the idea for a nine-seat oyster bar, with additional table seating and a limited menu, which included lobster rolls, soups, salads and other items that you might find at a lobster shack on a coastal New England road. The building, which many longtime locals remember as Hank’s Market, had previously been home to a sub shop, which had removed the kitchen equipment when it vacated the space. The new owners had to outfit the kitchen from scratch. As for the culinary talent, George IV had some high-school friends who’d gone into the hospitality business and were willing to work for up to seven months each to build a resume. Stephenson and her husband have had fun trying different items on the menu. “Their steamed shrimp? Amazing!” she said. It’s hard to stay away from the lobster bisque and crab cake. Right now, there is no fear of that. A fish tank gurgles against one wall, next to a sign that reads, “George & Sons. Thank you for coming in today! Just shuck it.” Strings of lights twinkle from a drop ceiling, and from anywhere in the bar you can see the refrigerated cases of fresh fish. The best seats are at the oyster bar, where you can watch the shuckers at work. This is truly the place where everyone will learn your name, if they don’t know it already. It might please the customers to have the Esterling family on hand on any given day. But how does the family feel about working with each other? George III’s wife and the boys’ mother, Mary Ellen Esterling, helps out with the bookwork when she’s not at her full-time job at the DuPont Company. The boys’ girlfriends pitch in when needed. There are occasional disagreements, but George IV said it helps that they all share the same vision for the business. By putting the focus on wholesale, some might say that George & Sons is filling the gap left by the closing of Dawson’s Seafood in Wilmington. But George IV said that’s not been a reason for the increased interest. The wholesale side has grown organically. He said businesses, including personal chef companies, are calling if their current vendor can’t deliver on time, or they’re unhappy with the quality. It’s not unusual for chefs in white coats to pop in and order seafood for the nightly specials. “We want anybody who isn’t getting attention from his or her current supplier to call us,” he said. The retail market and restaurant’s customers primarily come from the immediate area, but there are also a bevy from Kennett Square, Landenberg and Newark. One couple from New Jersey made the trek over the Delaware River because they said the seasonal closing of the Jersey Shore restaurants had left them without good seafood. Feeding these customers and filling orders takes a lot of legwork. Since there’s not enough cold storage for seafood in the Wilmington area, the Esterlings travel to a Philadelphia holding house four or five days a week for pickups. Swordfish, salmon and tuna remain staples. Older customers, many of whom did not grow up eating seafood, are happier with these familiar species. The younger customers are more likely to try less-expected items like taug, skate and tilefish, which George & Sons is selling. “There are a lot of fascinating and local species we should be eating,” he said.